Mellie was fantastic again in this episode, and I love Huck and Quinn together. Oh, Cyrus. It's literally the oldest trick in the book. How could you fall for that? God that was painful to watch! Yeah, when did Mellie become the heart of the show? Not complaining, she's a fantastic creation and Bellamy Young is doing great work. I thought they'd wait at least one more episode before Fitz and Olivia interacted. That was a very fast turnaround from "I'm NOT going to see her" to "Can Ms. Pope and I have the room?" Overall a weak episode with some good moments. We'll see how the season shapes up. It really needs some higher stakes to sell the drama, especially after the insanity of last year. Mellie is absolutely the only reason I am still watching this show, but for now, she is reason enough. But I would love to know what sort of discussions about creative choices lead to MacArthur Park: The Dance Mix as your big closing montage. I know Cy is lonely and all, but wouldn't you be super suspicious of anyone in DC not knowing who you are? Also, of someone (to my eyes) so obviously out of your league sidling up to you? Especially when that sort of shenanigans is the exact thing you pull on your own opponents? I can't find the thread for this week's episode. Has Scandal been dropped from FanFare? 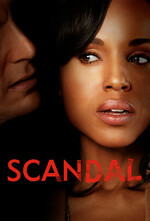 sanitycheck, go ahead and post a new Scandal thread if you like. No one person is in charge of doing that. I haven't seen the new episode yet myself.